Are Kenyan flowers actually more sustainable? Kenya is the biggest exporter of roses to Europe, transporting almost 160,000 tonnes of cut flowers in 2017. The country’s climate is perfect for growing flowers, its proximity to the equator providing daily sunshine and mild temperatures year-round. But an increasing awareness of the virtues of buying locally is sparking a debate around importing such goods: isn’t it better to grow them at home? Intuitively, this might make sense, but a dive into the figures shows what’s really more sustainable when it comes to flower farming. Food, flowers and other agricultural products that are grown near to the equator tend to have a lower carbon footprint than those produced locally under artificial conditions, studies have shown. Roses grow naturally in Kenya, but in the Netherlands, they must be grown in greenhouses under artificial heat and light. This makes the production process in the East African country 123 times more carbon efficient than in the Netherlands, according to one study. Transportation of the Kenyan flowers is far more carbon intensive and levels out the difference, but it’s still clear that Kenyan rose production is greenest: the entire process was calculated to be six times more carbon efficient than the Netherlands, when transport to Europe was included. Increasing energy efficiency and renewable energy use in the Netherlands is forecast to close this gap in the future, but there is still a long way to go. Exact figures from the study can be found in the table below, which show the CO2eq emissions from comparable flower farms. Note: Emissions are based on a functional unit of 12,000 marketable cut stems and are shown as Global Warming Potential (GWP) expressed in kg of CO2 equivalents using the IPCC (2001) conversion factors. 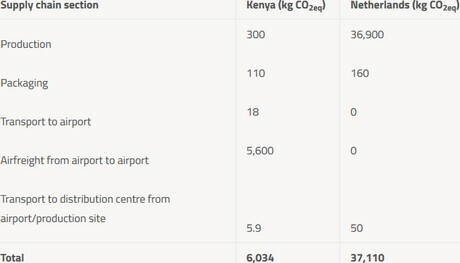 GWP and CO2 emissions from Kenya include the IPCC altitude factor. Source: The Dutch Ministry of Economic Affairs, Agriculture & Innovation (2012), who adapted the table from Edwards-Jones et al. (2008) with reference to Williams (2007). Air miles or fair miles? When it comes to conscious consumerism, it helps to look beyond CO2 emissions to consider the wider impact of buying choices; demonstrated by the concept of ‘fair miles’. By buying products which greatly contribute to a country’s economy, consumers support development and poverty alleviation. Kenya’s horticulture sector accounts for a third of the country’s agricultural GDP and is one of the leading generators of the country’s foreign exchange. Over half a million people are employed by the floriculture sector, 100,000 of which are directly employed by the flower farms. This is estimated to impact the livelihoods of over 2 million Kenyans. The growth of this sector contributes significantly to the economy, holding the potential to boost GDP and increase living standards in the long term. Many of Kenya’s flower farms are regulated by the Kenya Flower Council (KFC), which ensures fair wages and working conditions as well as responsible use of natural resources and pesticides. While solar-powered flights are still just a glimmer on the horizon, flower farms in Kenya have started to move to solar energy, reducing production emissions even further. It makes sense for these farms to utilise the abundant sunshine that grows their roses to power their operations as well, and not only for environmental reasons. High energy prices are a well-known concern for flower farms, with energy bills often accounting for a large portion of a farm’s operational expenses. The Kenyan Energy Regulatory Commission just announced another electricity tariff increase that will affect flower farms with a >20% price increase. This hinders potential growth: the sector’s forecast growth rate of 5% p.a. over the next 5 years could be significantly higher, creating further benefits for the economy. This growth is also sustainable from the outset, powered by renewable energy. The movement is in its early stages, but interest is growing rapidly, as access to solar is facilitated by full-service solar companies such as ecoligo. So, next time you’re brightening up a room, a mood or a day with beautiful roses imported from Kenya, you can rest assured that the carbon footprint is as low as possible – and that you’re supporting jobs and development where it is needed. And if you’d like to have even more of an impact, you can invest in a solar project for one of the very farms your roses are grown at. Click here for the original article with links to sources.